Muslims in Europe are increasingly converting empty Christian churches into mosques. The proliferation of mosques housed in former churches reflects the rise of Islam as the fastest growing religion in post-Christian Europe. There are now more practicing Muslims than practicing Christians in many parts of Europe, not only in large urban centers, but also in smaller towns and cities across the continent. As Islam replaces Christianity as the dominant religion in Europe, more and more churches are set to become mosques, which increasingly serve not only as religious institutions but also function as the foundational political building blocks for the establishment of separate, parallel Muslim communities in Europe that are based on Islamic Sharia law. The latest churches destined to become mosques are located in Germany, where the Roman Catholic Church has announced plans to close up to six churches in Duisburg, an industrial city in northwestern part of the country, due to falling church attendance. Duisburg, which has a total population of 500,000, is home to around 100,000 mostly Turkish Muslims, making it one of the most Islamized cities in Germany. Muslims in Duisburg are now clamoring to turn empty churches in the city into mosques, according to the Germany daily newspaper, Der Westen. All of the churches slated for closing are located in the gritty Hamborn and Marxloh districts in northern Duisburg where Islam has already replaced Christianity as the dominant religion, and where several Catholic churches have already been abandoned in a previous round of church closings. In Marxloh, all eyes are set on the Church of Saint Peter and Paul, which is the last remaining church in a part of Duisburg that is now almost completely Muslim. The church may be closed as early as the end of January 2012. Marxloh also happens to be home to the Duisburg Merkez Mosque, the largest mosque in Germany. Completed in 2008 at a cost of more than €7.5 million ($10 million), the Ottoman-style mega-mosque can accommodate more than 1,200 Muslim worshippers at a time. In addition to Roman Catholic churches, some Protestant churches have also been converted into mosques in Germany, where the Muslim population has jumped from around 50,000 in the early 1980s to more than 4 million today. In Germany as a whole, more than 400 Roman Catholic churches and more than 100 Protestant churches have been closed since 2000, according to one estimate. 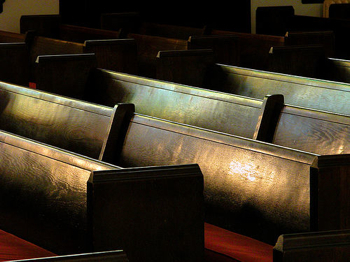 Another 700 Roman Catholic churches are slated to be closed over the next several years. By contrast, there are now more than 200 mosques (including more than 40 mega-mosques), 2,600 Muslim prayer halls and a countless number unofficial mosques in Germany. Another 128 mosques are currently under construction, according to the Zentralinstitut Islam-Archiv, a Muslim organization based in Germany. In neighboring France, mosques are being built more often than Roman Catholic churches, and there now are more practicing Muslims in the country than practicing Catholics. Nearly 150 new mosques are currently under construction in France, home to the biggest Muslim community in Europe. The total number of mosques in France has already doubled to more than 2,000 during just the past ten years, according to a research report, “Constructing Mosques: The Governance of Islam in France and the Netherlands.” The rector of the Grand Mosque of Paris, Dalil Boubakeur, has called for the number of mosques in the country to be doubled again — to 4,000 — to meet growing demand. By contrast, the Roman Catholic Church in France has built only 20 new churches during the past decade, and has formally closed more than 60 churches, many of which are destined to become mosques, according to research conducted by La Croix, a Roman Catholic daily newspaper based in Paris. Although 64% of the French population (or 41.6 million of France’s 65 million inhabitants) identifies itself as Roman Catholic, only 4.5% (or 1.9 million) of those actually are practicing Catholics, according to the French Institute of Public Opinion (or Ifop, as it is usually called). By way of comparison, 75% (or 4.5 million) of the estimated 6 million mostly ethnic North African and sub-Saharan Muslims in France identify themselves as “believers” and 41% (or 2.5 million) say they are “practicing” Muslims, according to an in-depth research report on Islam in France published by Ifop. Taken together, the research data provides empirical evidence that Islam is well on its way to overtaking Roman Catholicism as the dominant religion in France. In Britain, Islam has overtaken Anglicanism as the dominant religion as more people attend mosques than the Church of England. According to one survey, 930,000 Muslims attend a place of worship at least once a week, whereas only 916,000 Anglicans do the same. Muslim leaders are now claiming that, given such a rise of Islam in Britain, Muslims should receive a share of the privileged status of the Church of England. Overall, at least 10,000 churches have been closed in Britain since 1960, including 8,000 Methodist churches and 1,700 Anglican churches. Another 4,000 churches are set to be closed by 2020, according to Christian Research, an organization that tracks religious trends in Britain. By contrast, there are now more than 1,700 official mosques in Britain, many converted from former churches. In addition, there are an estimated 2,000 Muslim prayer halls and unknown thousands of unofficial mosques in garages or warehouses scattered throughout the country. Islam is set to displace Christianity in Britain even further in the years ahead. The number of Muslims in Britain is forecast to double to 5.5 million, or 8% of the total British population, by 2030, according to the Washington, DC-based Pew Research Center. But the official Citizenship Survey published on December 21 found that the number of people who call themselves Christians in England and Wales fell by nearly 10% over the past five years.